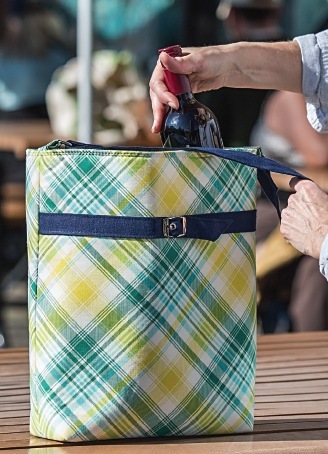 Students will sew a sturdy tote bag, the perfect size to carry two bottles of wine, groceries, or several books (see p. 74). The tote features an interior divider panel secured with hook-and-loop tape. This project is geared toward intermediate-level sewists who want to take their hardware skills to the next level. Students will apply interfacing and stabilizers, install eyelets with a setting tool, add a magnetic snap, and make a fabric strap with D-rings. This workshop can be completed in one 3½ to 4-hour setting, or in two 2-hour classes. To complete the project more quickly, have students arrive with fabric already cut and interfacing fused to the back. The classroom setup should include several rotary cutters, long rulers, and mats. Also, provide an ironing station for every three students attending. Keep in mind the number of students, and consider having them arrive with fabric already cut and interfaced to save time. That way there’s less waiting around to use a cutting mat or iron (for fusing). Instructions for the Two-Bottle Tote project are included on pp. 74-82. 1. Fuse the interfacing and attach stabilizer (can be completed before class). 2. Assemble the exterior bag. a. Make the shoulder strap. b. Make the decorative belt. c. Assemble the exterior panels. e. Make and attach the strap tabs. b. Attach the hook-and-loop tape. c. Attach the magnetic snap. 4. Attach the exterior to lining. a.Press and topstitch the opening.